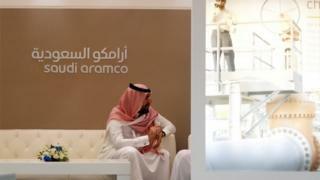 Saudi Arabia has denied reports that it cancelled its plans to sell shares in state oil giant Aramco. Reuters earlier reported that a group of financial advisers had abandoned a plan to sell 5% of the firm. The news agency quoted a source suggesting the decision was taken some time ago but was not being announced. Saudi Arabia's energy minister said the government would proceed with the flotation - which has been billed as the largest ever. "The government remains committed to the IPO [initial public offering] of Saudi Aramco at a time of its own choosing when conditions are optimum," Khalid al-Falih said in a statement. Mohammed bin Salman, Saudi Arabia's Crown Prince, first proposed the share sale early in 2016 as part of his economic reform agenda, to bring Western regulation and scrutiny to the company, as well as raising cash to reduce the country's large budget deficit. At the time he predicted the sale would value Aramco at around $2 trillion (£1.55 tn). The plan would see shares float on both the local stock market in Riyadh and one of the world's leading international financial centres. Reuters earlier said it had spoken to four senior industry sources about the plans being scrapped. "The decision to call off the IPO was taken some time ago, but no-one can disclose this, so statements are gradually going that way - first delay then calling off," Reuters quoted one as saying. The wire service said financial advisers who had been working on the listing were now focusing on the proposed acquisition of a "strategic stake" in local petrochemicals maker Saudi Basic Industries, according to two of its sources. In late 2017 rumours first emerged that the flotation might be cancelled, and it was suggested that Aramco shares might instead be sold privately to the world's biggest sovereign wealth funds and institutional investors. Saudi Aramco ranks as the world's largest oil and gas business. Forbes Magazine estimates it generates $1bn a day in revenues. Its businesses cover management of the world's biggest oil fields, as well as extensive refining and chemicals operations. With stakes this high, London, Hong Kong and New York competed fiercely to host the initial public offering. US President Donald Trump tweeted last year: "Would very much appreciate Saudi Arabia doing their IPO of Aramco with the New York Stock Exchange. Important to the United States!" In London the Financial Conduct Authority changed its rules to make the listing easier, attracting criticism from MPs and from the Institute of Directors who said adapting regulations to accommodate Saudi Aramco could harm the UK's reputation for good governance. No decision had been taken on where to list the shares. Meanwhile, there have been suggestions that some members of the Saudi royal family are concerned that a listing in New York may entail legal risks, citing US terrorism legislation that would permit US citizens to sue Saudi Arabia.